TOSHIBA Micro SD Card is newly upgraded that has much faster read speed than the traditional. It can expand storage space and give you ultimate speedy experience. 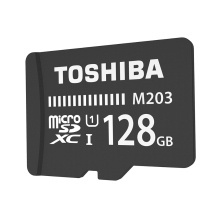 Toshiba M203 micro SD card is designed by Toshiba high-end process. It is a reliable partner of smartphone, sports camera, automobile data recorder and family camera. It can easily expand storage space and enjoy digital life. Great assistant of mobile storage that reduces application loading time. Fluent use of smart devices. Use built-in Toshiba 3D flash memory. The capacity of M203 can reach to 256GB. Large storage for ample space. Store much more photos. The read speed of new micro SD UHS-1 card can up to 100MB/s. It has reached to the high speed standard of entry level card. Transfer a 1.5GB file via PC is faster by 1.9 times than traditional medium level card. The Micro SD card is durable to use. It can stably protect your data safety. Waterproof feature can stand 30-min water rinse.